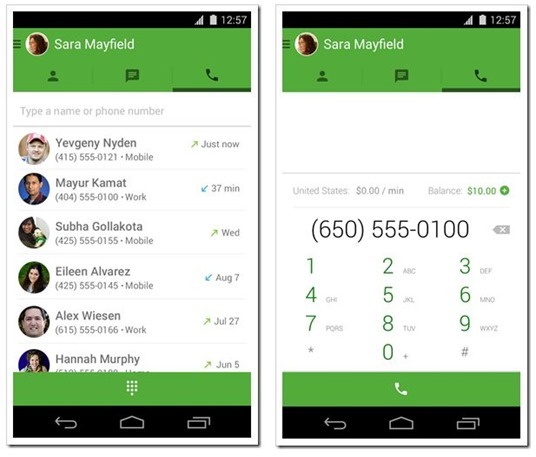 Google Hangout Dialer Brings Free Voice Calls To US, Canada Numbers! Slowly but surely we are moving towards free worldwide voice calling. The rates of voice calls have fallen nearly 10 fold over last decade or so, especially here in India. I remember how difficult and expensive it was to call USA and other foreign countries from India in late nineties and early 2000s. But today making an international call is not only easy, but extremely cheap as well. VOIP or Voice over IP is changing the way we make voice call across borders. While Governments and Telecom operators across the world are trying to curb it by putting legal restrictions, they have been largely unsuccessful. Now, the Big Daddy Google has announced something that will make them more jittery. In a official blog post, Google has announced that they are introducing free voice calls from Hangouts on Android, iOS and the web. And voice calls are not just peer to peer, but you can call on any normal phone or mobile number in the US and Canada. To facilitate normal calling, Google has introduced something called as Hangout Dialer App that will turn on the voice calls on your Android or iOS device. The only other thing you will need is updated Google Hangouts version (Version 2.3, which is rolling out in phased manner in next few days). We tried it on our Android devices, however, the update was not available for us at the time of writing. So, for normal users, once they have the dialer and updated Hangout apps, they will be able to make calls to any number in the world, just like they make calls normally to other numbers. While the US and Canada calls are free, other countries have call rates that are much cheaper that anyone else as well. We looked up the rates and compared it with some other providers, and sure enough the call rates offered by Google hangouts were quite low. Like we said in the introduction, the voice calls are not only getting cheaper, but are now getting to a level where they are virtually free. Many new mobile apps have also cropped up that have started offering voice calls to normal numbers for free. Recently we testedanother app called Nanu, which did a great job of making voice calls, although free calls available on the app were quite limited. Here I would like to add that I have an Indian google account, Indian cellular carrier, branded devices with latest android version.